Earlier this week Palmer Report helped set off a national discussion when we reported that an obscure and never-tested statute gave the Senate the power to advise and consent on Donald Trump’s decision to appoint Steve Bannon to the National Security Council – an article which our readers helped make go viral. Despite some pushback from skeptics, a plain text reading of the statute in question could not have been more clear. Accordingly, now the Democrats in Congress are pushing forward with a legal effort to block Bannon from NSC membership entirely. 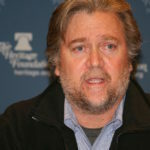 Trump appointed Bannon to be the Executive Secretary of the Principals Committee of the National Security Council, which may have been an attempt at working around the statute by technicality. But the committee is a subset of the council, so anyone on the former is by definition on the latter. To argue otherwise would be to argue that the quarterback of the offense of the football team isn’t on the football team because he’s the quarterback of the offense. But in any case, legal statutes notwithstanding, Senate Majority Leader Mitch McConnell – a key Republican ally of Trump – has shown no interest this week in exerting confirmation power over Bannon. And so now the Democrats are making legal moves to try to block him. Democrat Stephanie Murphy, who has a background in national security, has introduced legislation in the House which would block Steve Bannon and political operatives like him from being members of the National Security Council altogether. In so doing, Murphy is further elevating the national debate about the merits of Bannon’s unprecedented White House power grab, and the increasing public fury over the matter could end up backing Republican leaders like Speaker Paul Ryan into a corner. Palmer Report is proud of whatever role it may have played in raising awareness of the obscure statute in question, and the national discussion – and now legislative action – that have resulted. Whatever comes of Bannon and the NSC, this is why independent journalism matters at such a crucial point in American history. Help us defeat Trump.